(Chicago, IL) — The Chicago Film Critics Association (CFCA), (of which I’ve been a member since 2009), the Chicago-area print, online and broadcast critics group that celebrates the art of film and film criticism Film Festival is finally here. 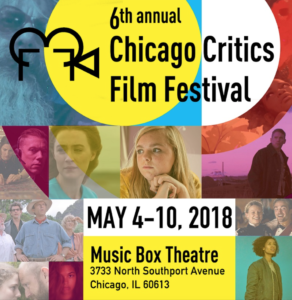 The complete lineup, schedule and special guests expected for the sixth annual Chicago Critics Film Festival, May 4-10 at the Music Box Theatre can be found in this article. Opening Night on Friday, May 4 features the Midwest premiere of Fast Color, starring Gugu Mbatha-Raw (A Wrinkle in Time) as a woman whose superhero powers send her on the run; Mbatha-Raw and the film’s co-writer and producer, Jordan Horowitz (La La Land), will be in Chicago for the occasion. More information on the complete schedule and special guests is below and online; festival passes and individual tickets are also available online here. Leave No Trace, Debra Granik’s story of a single father (Ben Foster) and his daughter living off the grid until a single mistake derails their idyllic existence. Featuring over twenty-five programs selected with care by some of the most respected film journalists in the city, this year’s Chicago Critics Film Festival includes four documentaries (Abducted in Plain Sight; Hal, about the career of legendary filmmaker Hal Ashby; Liyana; and Three Identical Strangers); presentations of two exceptional 35mm prints (a 25th Anniversary screening of Jurassic Parkand Yasujiro Ozu’s classic Woman of Tokyo); and two short film programs scheduled to screen on Sunday, May 6 and Monday, May 7. The festival’s Closing Night selection is Eighth Grade, written and directed by Bo Burnham and starring Elsie Fisher (Despicable Me) as a middle schooler enduring the tidal wave of contemporary suburban adolescence as she survives the last week of the school year before officially making it to high school. A Sundance Film Festival official selection, filmmaker Bo Burnham will be in attendance to help close out the festival on Thursday, May 10. Runner-up for Best Film Festival in the Chicago Reader’s 2017 “Best of Chicago” poll, the CCFF annually features a selection of acclaimed films chosen by members of the organization, a combination of recent festival favorites and as-yet-undistributed works from a variety of filmmakers, from established Oscar winners to talented newcomers. It is the only current example of a major film critics group that hosts its own festival. The best way to ensure access to every aspect of the week-long event is to secure a festival pass, just $150 and available online here. The Chicago Critics Film Festival and the CFCA gratefully acknowledge the support of festival sponsors, including Abt, the Chicago-based electronics and appliances store, returning this year. Follow the CFCA and the festival on Twitter at @chicagocritics and on Facebook here.